Sugar and spice and everything nice. That's what little girls are made of, right? Well, not exactly, it seems. 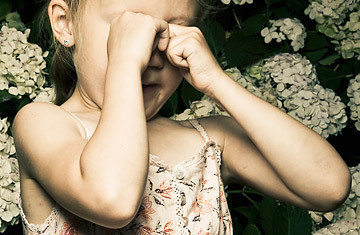 Bullying and nasty cliques start as early as elementary school, says Michelle Anthony, a developmental psychologist and the co-author of Little Girls Can Be Mean: Four Steps to Bully-Proof Girls in the Early Grades (St. Martin's Griffin). Anthony and her co-author, Reyna Lindert, have developed a helpful technique for parents to employ. In brief, they advise observing the social situation, connecting with the child and guiding the child to the point that she is supported in her actions. TIME senior reporter Andrea Sachs spoke with Anthony about their research and conclusions. Our interest in this topic began personally as the mothers of young girls. My eldest daughter, when she was 6, was enmeshed in a two-year-long struggle with a friend. For the first year, I didn't even know about it, because she felt so alone and isolated that she didn't talk about it with anyone. She tried to get help from her teacher, who sort of told her to thicken her skin over it. She took that to heart as being her problem and really was silent for a while. Then it became apparent as it began influencing her life more and more. Dr. Lindert's daughter in fifth grade was ousted from her friendship circle in the middle of the year and basically had to start over socially. So our interests really began as mothers, and then knowing our background and our expertise, we began working with families and parents and girls. Oh, I think it's extremely common. I don't think there's a single school in this country where a good portion of girls aren't dealing with friendship struggles and various degrees of social cruelty. I think what's more uncommon is to have a language to talk about it. So many girls are facing these struggles alone. Either their parents say, "She'll be nicer tomorrow," or "Just find another friend," or "Don't play with someone who's mean." We're doing it from the best place, we're doing it to be helpful. But the problem is, for the girls themselves, it's isolating them further, because it's basically saying to them, "This is your problem to figure out by yourself." I think what we're talking about here  in terms of social cruelty and relational aggression  is more common among girls. Which is not to say that it doesn't happen with boys. But if you had to stereotype, girls more often use social power to have influence over their peers, and boys more often use physical intimidation to have power over their peers. Some people would argue that the physical blow from a boy bully might be more acute, might be more dramatic, might be more dangerous. But what research has shown is that girls' relational aggression tends to involve more people, and it tends to last longer, and in that way is just as devastating for the girls who experience it. Sometimes. When it gets bad enough, they usually do. And if they don't, parents  especially parents who are taught to recognize shifts in their children  will begin to notice changes. More often than girls coming and saying, "I have this big problem," you'll see shifts in behavior. They'll stop liking things they used to like, or they'll start complaining about headaches or stomachaches more, or that they don't like [a particular] class, because that's where these things are happening. When girls come home, there are sort of codes that they use: "She was mean"  that's a very common phrase for a child to use  or, "My friend and I got in a fight." Is it ever necessary to enlist the school's help? Absolutely. In every case? Absolutely not. But I'm a very big advocate of parents not staying alone. Teachers, guidance counselors, principals, social workers  there are a slew of people in these school districts whose purpose is to help kids learn. And when kids are stuck in social strife, they can't learn. To face it alone doesn't make any sense. For parents, to reach out to get more knowledge and more support is so beneficial to their child. This isn't about tattling on some other child and saying, "This kid is mean." It's really about understanding the situation that your child is in. Yes. That's one of the big things about the difference from when our generation was growing up. Meanness happened then too, but the sphere of influence was much smaller. The public and permanent nature of the acts today  because of social-networking sites, technology and the Internet  make it very real for these kids since everyone is involved. Whatever happens will last literally forever. This behavior peaks around middle school and the very beginning of high school. It tends to decrease over high school, because the girls' friendships become more stabilized and they really learn how to interact and to support one another, and to have the kind of friendships that we think of as adult friendships. See a photo-essay about Detroit schoolkids' dreams for the future. Read "Bullying: Suicides Highlight a Schoolyard Problem."